﻿ What is XPAK Transceiver? XPAK Multi-source Agreement (MSA) was published in 2002, which have the member of Blaze, E2O Communications, Opteon, Fujitsu, Picolight, Infineon Technologies, Intel, Tyco Electronics, and Molex. In the XPAK MSA, it defines mechanical, thermal, and electromagnetic interference (EMI) mitigation features of the form factor, as well as reference 10-GbE optical and XENPAK MSA electrical specifications. 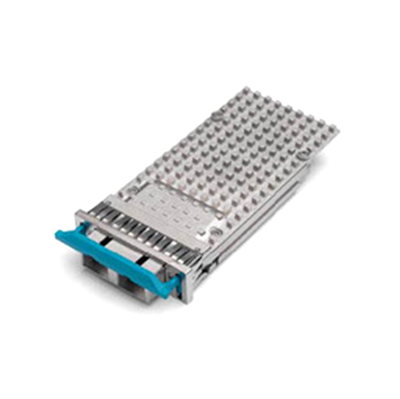 Offering higher port density, power efficiency, and ease of integration to networking equipment, the XPAK module enables network equipment manufacturers to implement 10-GbE links up to 10- and eventually, 40-kilometers, claim group representatives. This increased distance enables 10-Gigabit Ethernet to move from aggregated uplink applications to high-volume, server-to-switch, and storage-to-switch links. For more information on the XPAK MSA, click to download the INF-8475. XPAK with the same pinout of 70-pin XAUI (10-Gbit/sec Attachment Unit Interface) like XENPAK, but with a smaller size that offer increased densities to switch and router equipment manufacturers. The low height, limited depth, and single-sided mounting capability of the XPAK form factor also enable PCI card applications including 10-GbE network interface cards, channel adapters, backplanes, and dense-packed SAN and enterprise switches.